There are four “big cats”, that is cats that are big and that roarrrr… These are the Tiger, the Lion, the Jaguar and the Leopard. The Tiger is heavier but the Lion is taller. And Lion is the king. 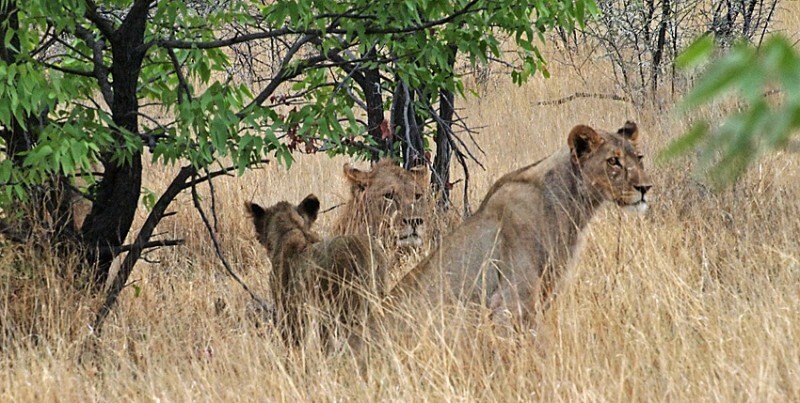 So lions are there, but they are not very easy to find. 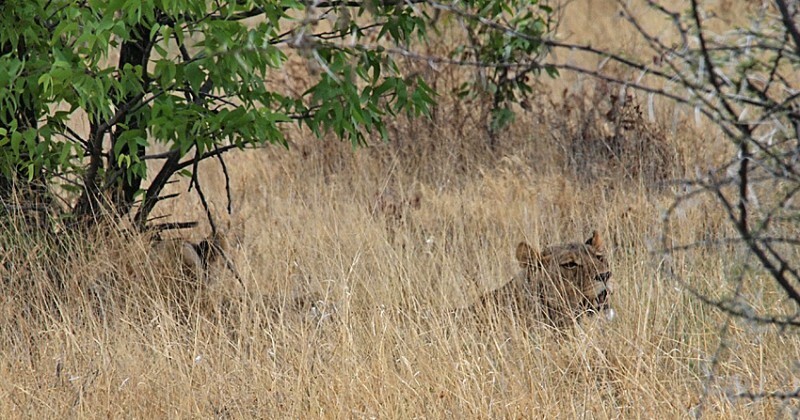 After a while we found that there was a group of lions. And they had recently been eating really close to the road where we now saw jackals enjoying the left-overs. 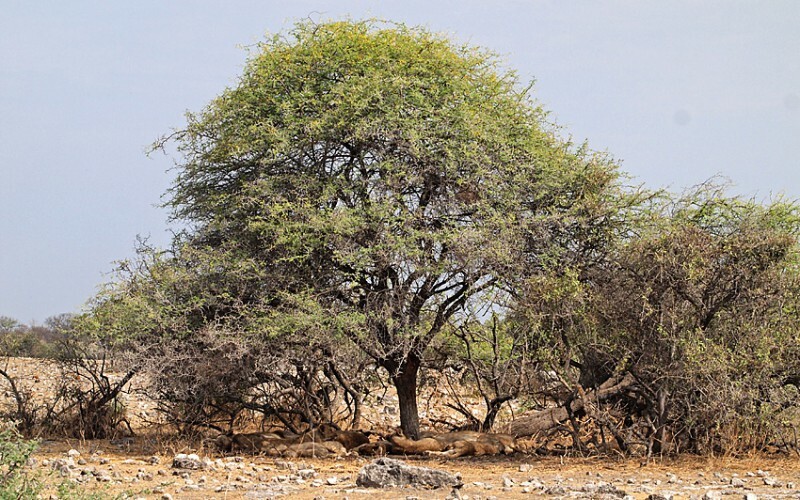 We continued our visit in Etosha but saw no more lions that day. Late on our third day we had that car breakdown and had to go to the Namutoni Camp to get it fixed. 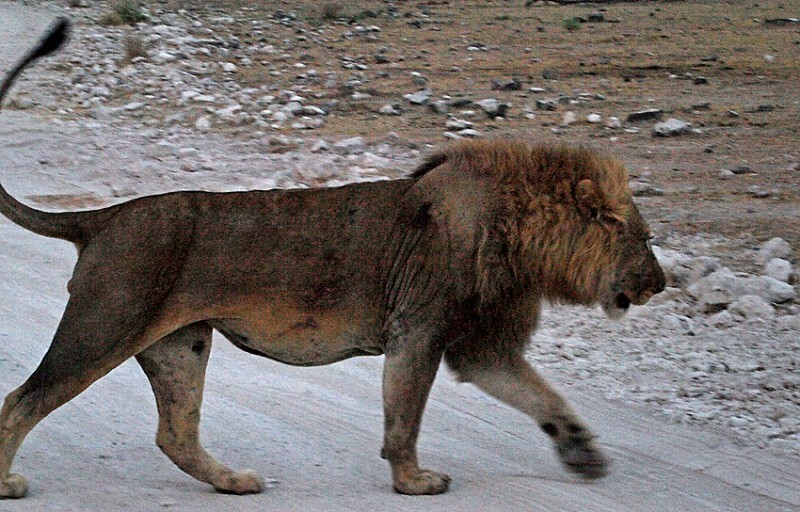 The friendly man that helped us asked if we had seen the lions at Klein Namutoni (a waterhole close to the eastern gate). So with the car fixed we set off for lions. More experienced this time we did not look for lions but for a group of cars. We saw no group of cars but Saga suddenly yelled… Look! Hard to see but there they were. A family with two mothers and a bunch of kids. Very satisfied and tired after a big meal. Like visiting this family in their living-room one lazy Sunday afternoon. 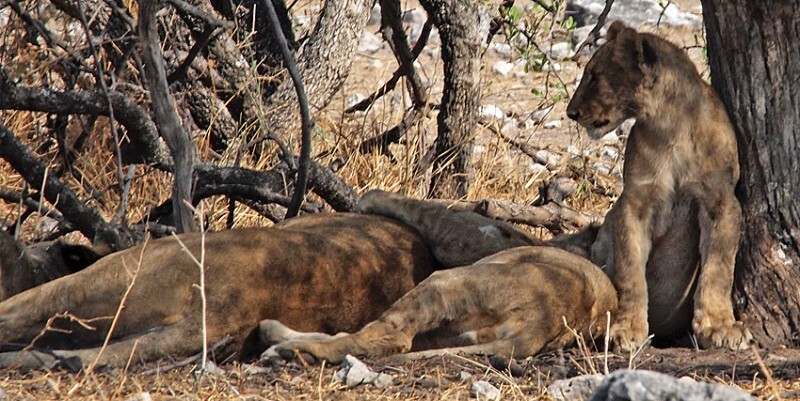 This is the most typical life of lions. They rest for about 20 hours a day. The other four hours are for hunting and making love. If you skip the hunting I can be a lion in my next life. Lions are big animals. The average weight for a male is 181 kg and 126 kg for females but a man-eating lion shot in South Africa 1936 weighed 313 kg! After some time the group started to wake up and move, slowly… leaving the shadow from that nice tree. 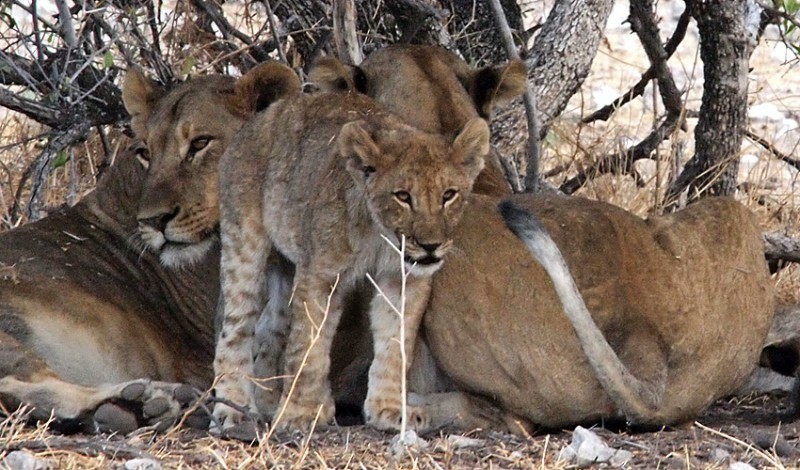 Ten thousand years ago the lions were the most widespread large land mammal after humans. 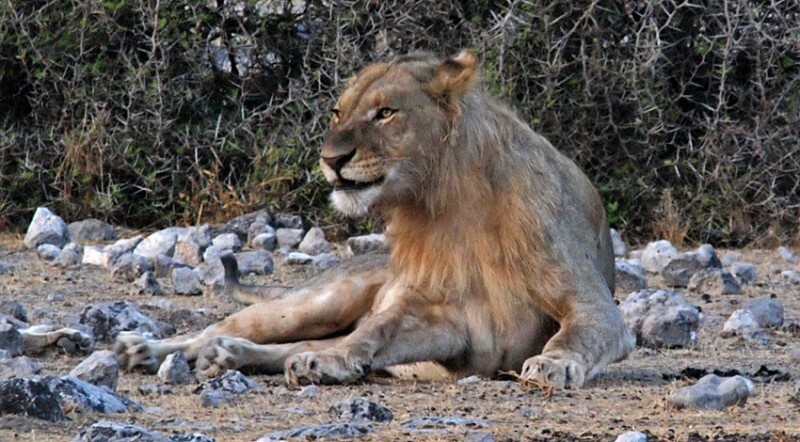 Today there are some lions in Asia, but most of them are today found only in central and southern Africa. Here is a young male. He will probably not live more than ten years. Constant fighting between male rivals is the reason. Females live longer, up to 14 years. When males are mature they have to leave the group. It is common that these males form a pair with a relative male and live so for some time. Some males are never able to go back to a group again but stay alone or in that pair. Lions are very social. They form groups with related females and their offspring and a small number of adult males. The hunting is mostly done by a group of females. Lions are very powerful but they can’t run fast for a long time. So they hunt in groups, trying to get as close as possible before starting the attack. …these two scarred fighters came out of the forest. They crossed the road just in front of the car. 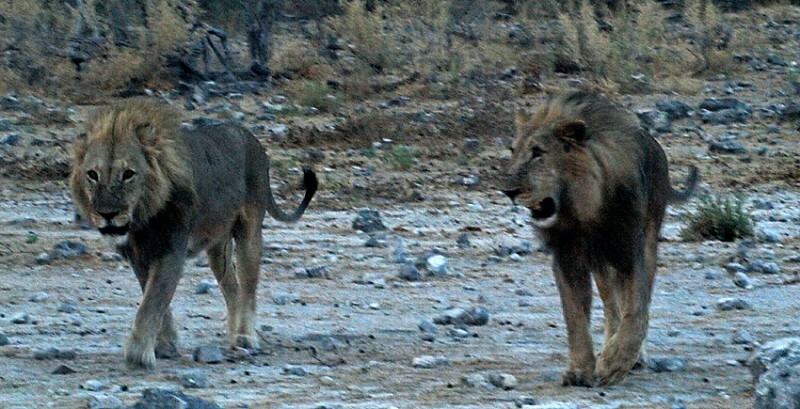 Nice ending to our Etosha visit!